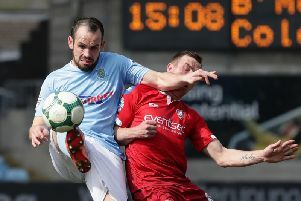 Ballymena United manager David Jeffrey is hoping a former player does not return to haunt his team in the Danske Bank Premiership clash at the Showgrounds. The former Linfield manager released striker Darren Henderson in the summer and Jeffrey knows that Ards striker Henderson will have to be watched at the Showgounds as his side look to keep tabs on Linfield at the top of the table. “Darren was most impressive when I saw him last weekend against Coleraine. He played for 70 minutes and did very well. “He really led the line well and he was always very talented. He has good touch and he worked the Coleraine defence very hard and knowing Darren he will want to come here and do something. “But he had a great time here and he is a fantastic professional and like every good professional he gives of his best for the team he is playing for. Tomorrow’s visitors are bottom of the table after a poor start to the season where scoring goals has been a problem for Colin Nixon’s side but Jeffrey is surprised that Ards are not doing better with the players they have. “I watched Ards last weekend and they were very impressive and did not deserve to lose the game. “They were excellent and their performance was not that of a team at the bottom of the table. They are fighting for their lives and Colin Nixon has them up for the challenge. “From a neutral’s point of view they were very unfortunate not to take something out of the Coleraine game. And Jeffrey says it is good to have nearly a full squad to pick from as they reach a very important part of the season. “Its great to have most of them back and they are champing at the bit. And Ards boss Nixon has become frustrated in recent weeks as side have played well but are still coming up short - and he knows something has to change. “I’ve tried all season to change it. “I’ve changed up training, prematch schedules, I’ve tried everything. “I said to the boys I’m actually pulling what’s left of my hair out wondering what more I can do to change it, because I can’t ask any more from the players, I thought they were all super against Coleraine. “We end up with nothing though from the game because we’re naive. “With the style of football we play we shouldn’t be at the bottom of the league. “But by the same token if you don’t defend properly and you don’t take you’re chances then you’re going to be at the bottom of the league. And Nixon was disappointed that his side did not get something from their last league clash against Coleraine. “It’s heartbreaking, but again we’ve contributed to our own downfall. “We totally played Coleraine off the park in the second half, I don’t know how many chances we’ve created, some really gilt-edged, but we didn’t take them. “We were also relying on the referee standing up and making decisions, I thought the referee was really poor today. It was a definite penalty, but we don’t get it. “We switch off in the last minute and are sucker punched again.